Stina has been a member of the Women’s Fund since 2005. She has a BA from the University of Massachusetts and an MS from California Lutheran University. 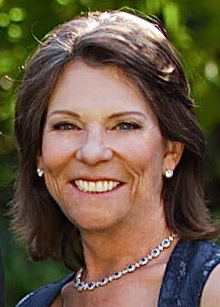 Her corporate career includes the presidency of Vista Hospital Systems, Inc. and MCBA, Inc. During her 30 years in the business world, Stina served on a number of boards including the International Boards of the Young President’s Organization, the World’s President’s Organization and the Chief Executives Organization. She is the only woman to receive the Weaver Award for being a “leader among leaders.” In the nearly 30 years Stina has lived in Santa Barbara she has served on various community and educational boards. She served on the Women’s Fund Research Committee for three years, as Research Co-chair in 2008 and 2009, as Membership Chair in 2011 and as Steering Chair in 2012. She currently serves on the Board of Directors for Girls Inc. of Greater Santa Barbara. She has served in many positions in the Women's Fund: Research Co-Chair in 2008 and 2009, Grantee Liaison in 2010-11, Steering Chair in 2012-13, Chair of the Women’s Fund Presentation of Grants Event in 2015 and 2016. She now serves as the Group Captain Liaison.